It was son to be my dad’s birthday. I love making cakes and only need an excuse to get baking so I had a think what to make for him, they were going on holiday in a month’s time so I thought it would be a great idea to make a holiday cake. I started by making the cake top decorations. 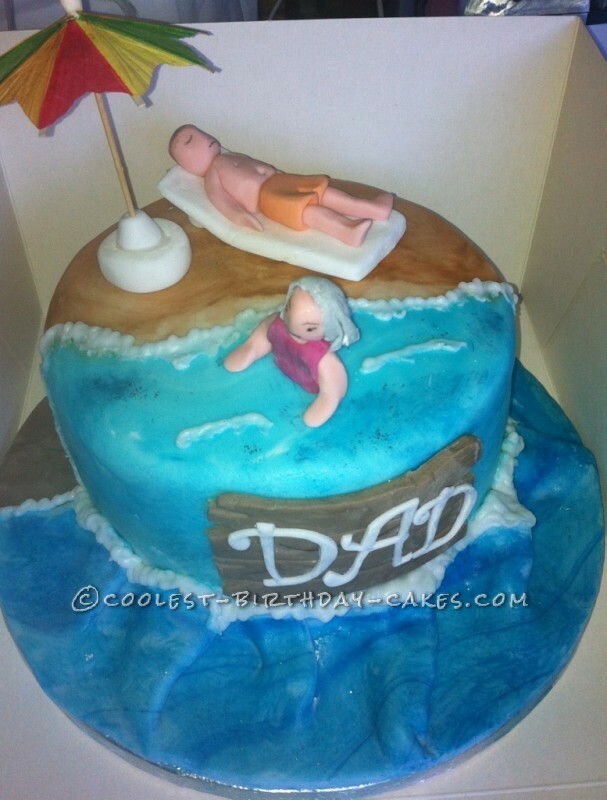 I made a man on a lounger and the top half of a woman, as she was going to be in the sea. I made a base for a parasol and I used a parasol I had in a cocktail while on holiday. I set all these aside to dry out. A couple of days before dad’s birthday I baked an 8″ round vanilla sponge and when cold I filled with butter cream and jam and then covered in butter cream and chilled in the freezer for 20 mins. Now it was time to cover the cake. I colored some icing in blue and when all blended in I added a small amount of dark blue and kneaded it till I had a marble effect. 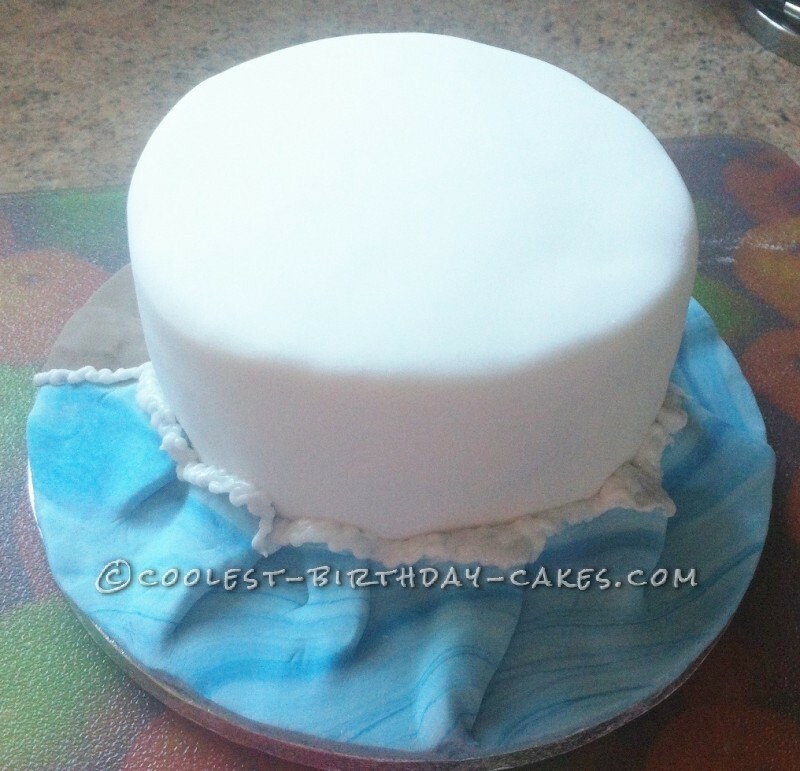 I covered half the cake and ruffled it to resemble waves around the cake board. 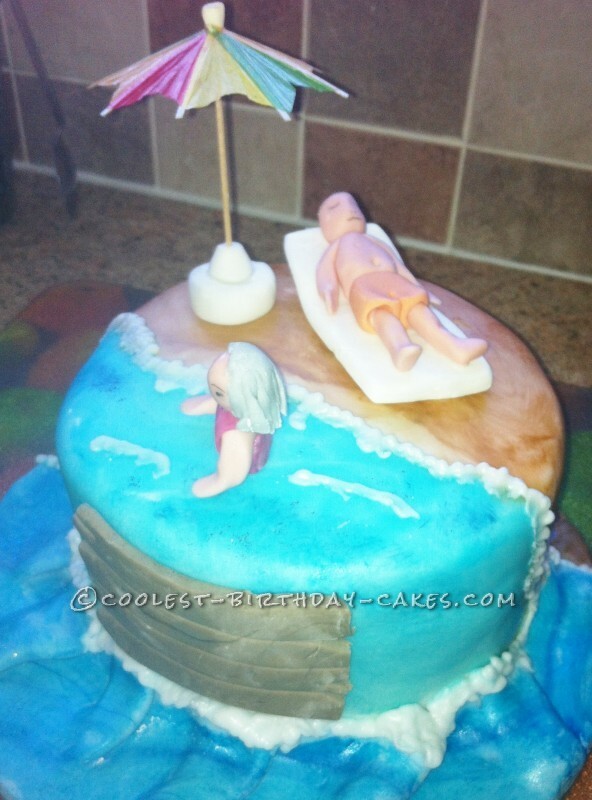 I then colored some icing in a sand color and colored the rest of the cake and cake board and then scraped some icing in white where the join is to resemble the waves on the sea. I did this in a few more places on the blue on the top of the cake. I then added the man on the lounger and the parasol to the beach and the woman in the sea. With the left over brown icing I added a little white and mixed till I had a wood effect and cut out a plaque resembling wooden planks. I then cut out the letters DAD and attached these to the wood effect plaque. I left this to harden slightly and when It was hard enough to move I attached it to the front side of the cake. The cake was now finished and he loved it.